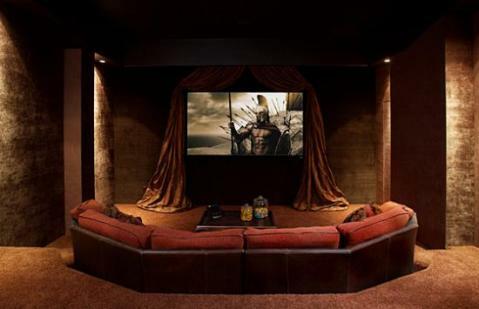 An Important characteristic of a home theatre of good quality is the size and shape of a room. 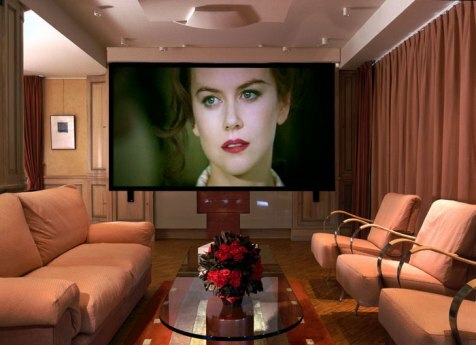 The most suitable shape for a home theatre is rectangular. 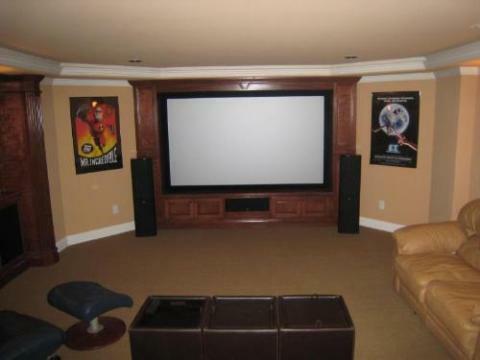 The appropriate position for home theatre seats should be far from speakers much more than 3 feet. 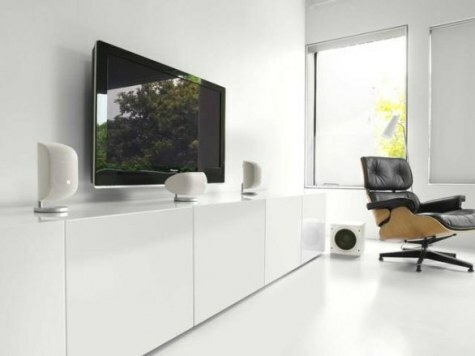 1) Absorptive acoustic panels: have the ability to absorb most of the sound waves. 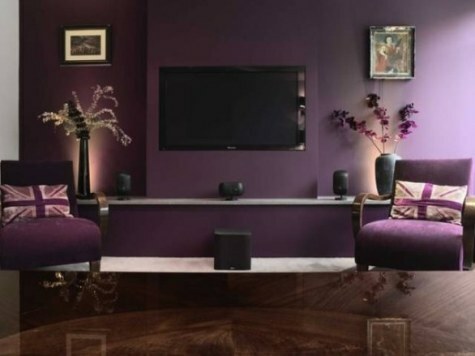 2) Diffusive acoustic panels: that can distribute the sound wave and make the room to sound more alive and vivid. 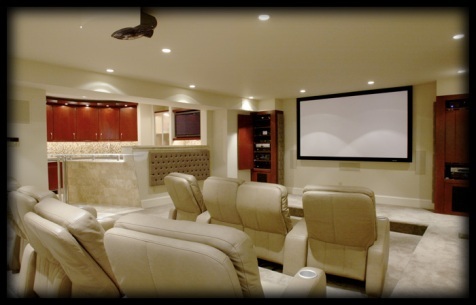 When thinking in creating or buying a home theatre, there are primary ideas should that should be taken into account like seats, display screen, seating, hurdles that will consume and distort sound, and additional accessories such as video gaming. 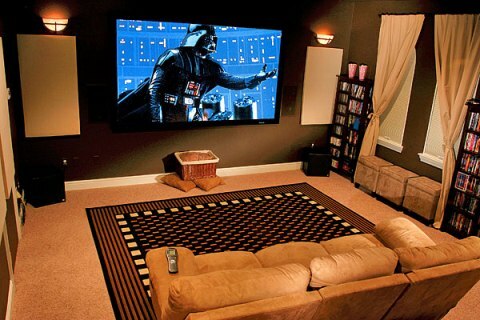 It is also up to you if you need to install a subwoofer system from a DVD player. 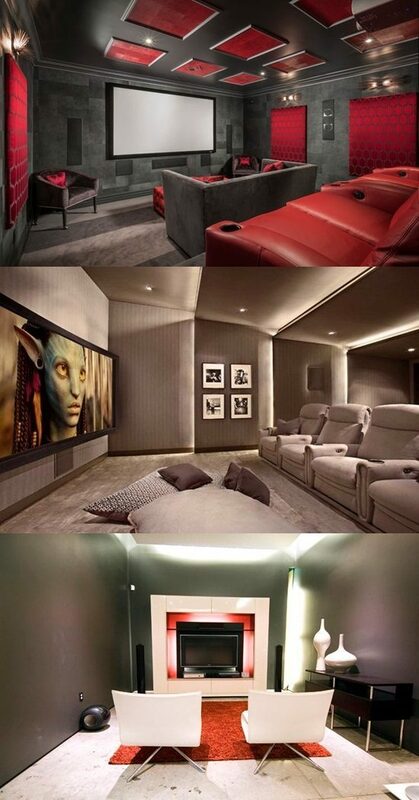 Storage space is needed to keep a huge collection of Movies, Vinyl, CDs, DVDs. The audiences might make use of a raised platform or even terracing. 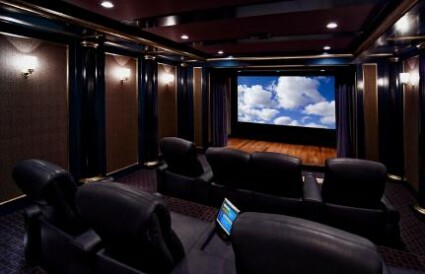 Since you will spend considerable time watching movies in your home theater, you should allow good ventilation. 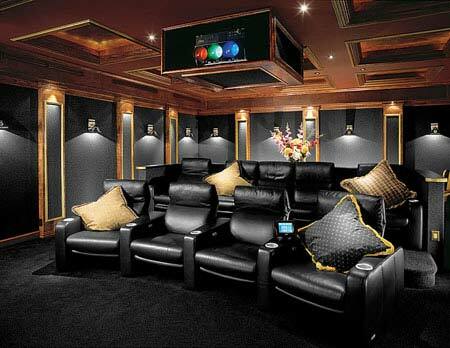 The best of home theatre design involves the utilization of drapes, carpeted flooring, and improving the encompass audio system. 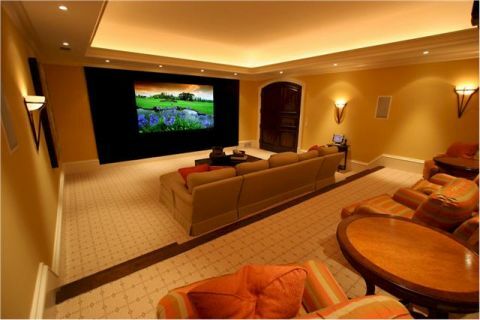 By installing a light dimmer, you will much enjoy watching your favorite movies. 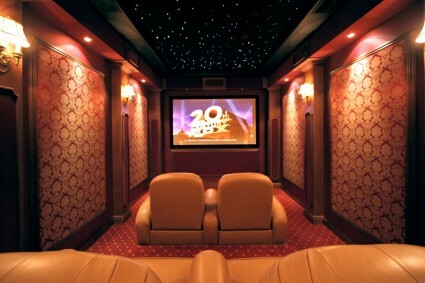 By designing your Home Theatre, you will be satisfied seeing your favorite star action movie in a comfortable way. You can consult a professional designer who will implement your idea. 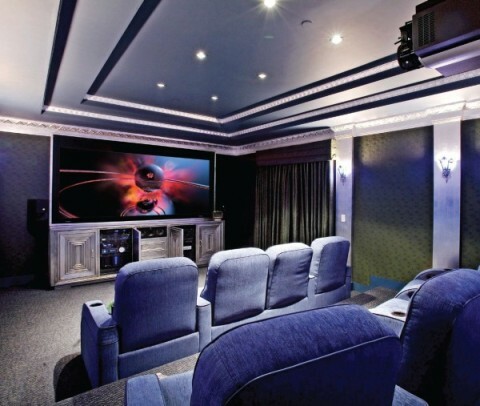 But there is a crucial step when planning Home Theatre Design: defining how big the room to establish your entertainment dream space. It is important to get your budget suitable to what you do! 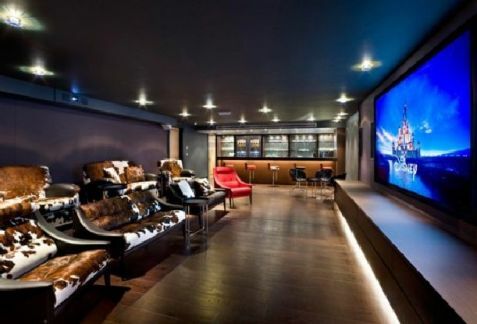 Modern Home Theatre Interior Design Ideas- There is a photo gallery of the best models you can choose from. 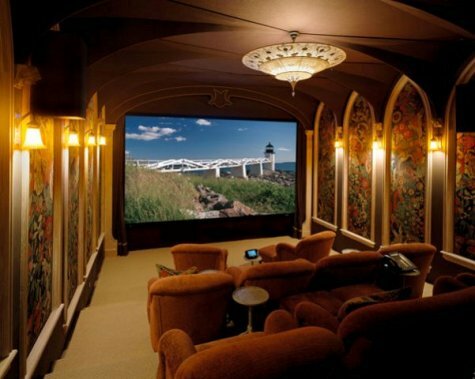 Some ideas of the Decoration of Home Theatre: Firstly, painting the walls and ceiling /roof of the room with a suitable color that you love. Choose a material can be easily cleaned for flooring. 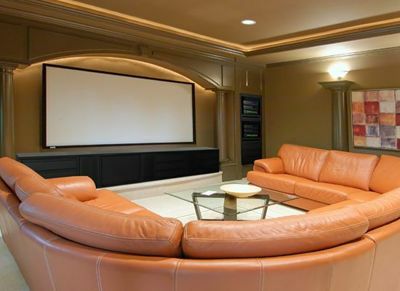 Select, for light system, recessed lighting; use incandescent bulbs and add dimmer control. 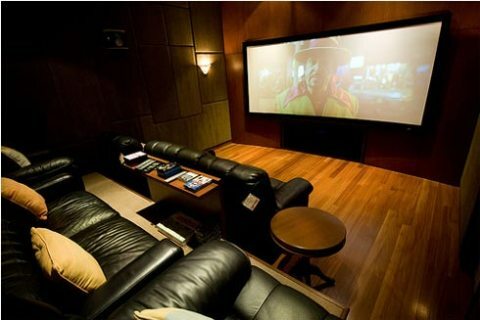 Use, if you can afford, the seat of two levels that enables anyone sitting in the home theater room to enjoy a good view. The most popular materials used in making seats are leather. Accessories are wonderful also! Posters of favorite movies, and large poster frames are good things. 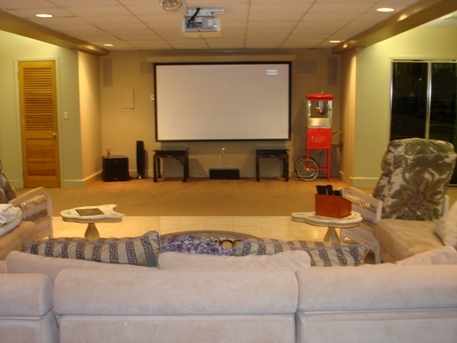 Home theatre room might also have culinary appliances such as microwave, fridge, small cooler …etc. What is 2 * 5?